working in Clubs and Trucker/Biker/Country festivals. miles from Gig to Gig. never quite made it with record companies. song writer, Johnny Wakelin, who’d had a lot of chart success in the 70’s. country songs that he could use. Johnny sent him 30 songs and wished him luck. of the songs written by Johnny. and it’s a ‘Thank You’ to all the keen fans that J R has met over the last twenty years. Rock and the original style C&W. Songs for the lovers of Country music, and all those who like to run free. RadioIndy created a CD Announcement Press Release for J.R.Leonard on Digg.com! "Truckers Finest-Bikers Best" Reviewed by RadioIndy.com! 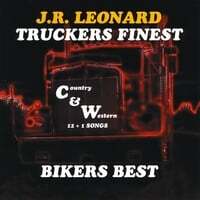 "Truckers Finest-Bikers Best" is the latest country/western CD from J.R. Leonard. It’s an album recorded with the mindset of the free-living American west. You will find good ole' fashioned country songs, western ballads and some more edgy rock tunes as well. In "Darlene From San Antone" J.R. sings a love story in a catchy, honky-tonk, gotta-dance fashion. Then he changes the pace with tracks like "Message From Elvis,” a slow moving and bluesy country song. He shows us his edgier side with "Lay Down and Rock Me," a gritty rock song played almost in ZZ Top style. J.R. Leonard’s "Truckers Finest-Bikers Best" CD should have something for everyone; whether you are a fan of Jerry Jeff Walker and Johnny Cash, or prefer a more modern and mainstream approach to country music. Mix of Modern and Traditional Country. You’ll find Country Ballads, Country Rock and the original style C&W. Songs for the lovers of Country music, and all those who like to run free.